I turned 40 years old last week. To me, it doesn't seem like that big of a deal... it's a different number, but I'm essentially the same person I was the day before, the week before. I'm probably a bit wiser than I was at 35 and 30; I understand things better, I know how to do things I didn't know how to do before, I have friends I didn't have before, but I'm basically the same guy I was then. But when you turn 40, people love to kid you about getting old, and I was no exception. My own wife, who insists that she loves me, presented me with a gift bag which contained Polident and Epsom Salt. There was some discussion about what kind of walking cane I would be needing. And my so-called "friends," Robert and Sandra, proudly handed me a package containing one of the ugliest suits I've ever seen. 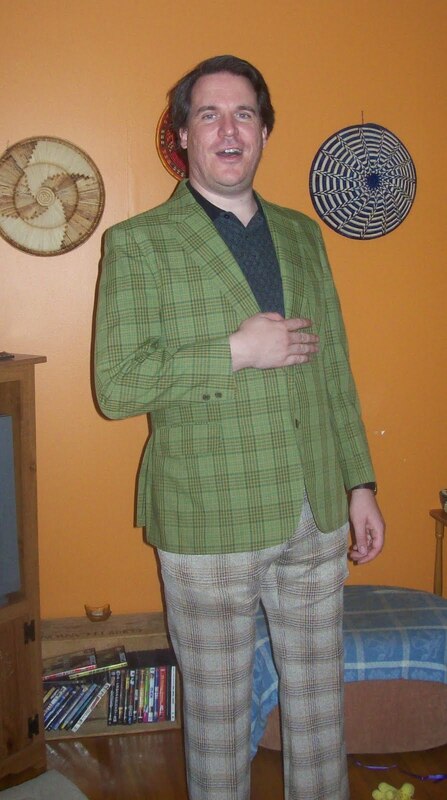 It's not actually a complete matching suit; it's a plaid suit jacket of a green color that clearly was invented in the seventies to not show a stain if you spilled pea soup on it. The pants are kind of a sandstone brown color, also plaid, but with a noticeably different pattern. The sleeves of the jacket are a good two inches too short for my arms. The pants are too short, too, and the inside of the waistline says "HAGGAR EXPAND-O-MATIC." I put the suit on, and it was positively hideous! My children were in the room; I'm sure I have lost their fashion respect for the rest of my life (as if I had any fashion sense at all anyway!) Robert and Sandra's dog was nowhere to be seen; I'm pretty sure he had run out of the room in terror, tail between legs. I modeled my stylin' new outfit, a picture was taken, everybody had a good cackle, and then I took the "suit" back off. I actually seriously considered wearing it home, just to be silly, but it doesn't fit that well, and it was kind of hot and scratchy for summertime. If I had worn it home I would have been uncomfortable, and it just wouldn't have been right. A few days ago as I was looking at the body of my sweet, beautiful sister-in-law lying there in her coffin, although she looked quite pretty (her loving daughters had brought one of her nice dresses and done her makeup just like she wore it in life), compared to heavenly body she is "clothed" with now, that body is just a mismatched, outdated, uncomfortable suit that doesn't fit quite right. She couldn't wear that body home; if she could somehow have tried, it would have been uncomfortable, and it just wouldn't have been right. When one day I get to join Theresa in Eternity, I know I'm going to say, WOW girl, you look INCREDIBLE! I'm sure she'll say the same about me. I probably looked quite a bit better yesterday when I took off my new suit and was in my regular clothes again, but not as much better as I will look when I take off this mortal, decaying body of mine, and put on immortality! I call this shot "Snazzy!"